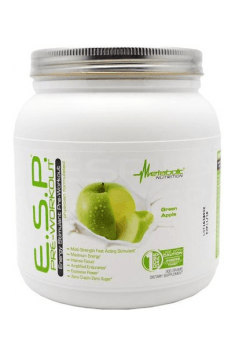 Metabolic Nutrition E.S.P DMHA is a specially designed pre-workout formula that contributes to increasing the body's efficiency while maintaining a high, yet controlled level of focus. The supplement effectively eliminates and delays the occurrence of fatigue, improves nerve conduction and regulates the water management of the body, which is due to, among others, the presence of electrolytes, vitamins, minerals, amino acids, and stimulants. What distinguishes the supplement is the addition of DMHA (2-aminoisoheptane), which strongly stimulates the release of catecholamines and prolongs their activity without causing apathy. Caffeine – the most popular alkaloid with ergogenic properties. It reduces the feeling of fatigue by joining the adenosine receptors, which in turn displays an inhibitory function in the CNS. Caffeine contributes to maintaining a high level of focus and concentration, e.g. during a training. Caffeine increases the release of catecholamines and prolongs their activity. This is the result of, among others, its ability to inhibit the cAMP-phosphodiesterase enzyme and thereby to maintain the proper level of cyclic adenosine-3 ', 5'-monophosphate (cAMP). 2-Aminoisoheptane (DMHA) is a safe and, most importantly, legal substitute for the already-discontinued DMAA. It strongly stimulates the release of norepinephrine and dopamine, or neurotransmitters responsible for well-being, motivation and cognitive function, without causing apathy. DMHA also improves aerobic capacity (has a relaxant effect on the bronchi) and increases the rate of oxygen flow by narrowing the blood vessels. This makes it easier to cover the muscle demand for oxygen and nutrients, and to delay the emergence of fatigue. Theobromine – a plant purine alkaloid found mainly in cocoa. Similarly to caffeine, it is active in the CNS and is an inhibitor of the phosphodiesterase enzyme. This alkaloid contributes, among others, to lowering blood pressure (it has the ability to dilate the blood vessels), and also improves mood, increases cognitive functions and displays a slight stimulating effect. Tyrosine – an amino acid that is converted into dopamine, that is a neurotransmitter responsible for memory, motivation, concentration and a feeling of fulfillment. Tyrosine reduces the feeling of mental and physical fatigue, helps to maintain concentration and increases resistance to stress. In addition, this amino acid may be used for the production of thyroid hormones – triiodothyronine (T3) and thyroxine (T4), which are responsible for, among others, normal metabolism, and energy level. Choline bitartrate – a form of choline that is part of the phospholipids building the myelin sheath. This substance is key to the production of acetylcholine – a neurotransmitter responsible for memory, nerve impulses flow and muscle contractility. Choline also improves lipid metabolism in the liver and may facilitate weight loss. Beta-alanine – an amino acid that together with L-histidine forms carnosine. This compound is a buffer of hydrogen ions, which when produced during a workout contribute to the lowering of pH level, leading to the emergence of tiredness and "burning" of the muscles. Beta-alanine positively affects the body's performance and allows for a more intensive or longer training. Sodium – an element that is responsible for regulating the body's water management. It maintains the proper level of water in the extracellular fluid. In addition, it ensures the proper conductivity of nerve impulses in the CNS, and a low level of sodium may cause muscular weakness and involuntary contractions. Potassium – regulates the concentration of intracellular fluid and increases the transport of nutrients to the cells. It increases muscle contraction and the use of muscle glycogen, and, along with sodium, it regulates blood pressure. Calcium – essential for healthy and strong bones. It is extremely important in the course of many enzymatic reactions, it is responsible for receiving and transmitting nerve impulses and participates in contractions of muscle fibers. Magnesium – supports the proper functioning of the nervous system and increases the use of oxygen by muscle tissue. It participates in the transport of sodium and potassium and in the formation of high-energy compounds. Vitamins from group B (B3, B6, B12) – they participate in many enzymatic reactions, intensify detoxification processes of the organism, support energy production, regulate the functioning of the nervous system and participate in hematopoietic processes. In conclusion, Metabolic Nutririon E.S.P DMHA is an advanced pre-workout supplement with long-lasting, moderate stimulating effect. The product is ideally suited for individuals who need arousal, but at the same time want to maintain an optimal level of concentration and motivation, without a typical apathy or "crash" effects after discontinuing the substance. The powdery form facilitates convenient dosage, which can be adapted to individual preferences and tolerance to stimulants. Powder spills out from the cap. Take one scoop (3,3 g), dissolved in 150ml of water. 1 level of dosage of the small scoop with 150ml of water 15 minutes before a workout. The manufacturer recommends starting the supplementation with one small measure (3.3g), and then along with the growing need for more stimulation, the dosage can be increased to 2 small measures (6.6g). It is not recommended to take the supplement in the evening, due to the high content of stimulants. Do not exceed two measures a day. In the event of an accelerated heart rate, dizziness, severe headache, shortness of breath or other similar symptoms, the dose should be reduced. The supplement is intended for healthy people. The largest supplier of health and nutritional supplements. They have gained a reputation for their commitment to providing top quality products and excellent customer service. The company was founded in South Florida more than 20 years ago, has always maintained the highest standards of ethics, health and business. Constantly strives to strengthen the industry by starting new divisions. Metabolic Nutrition passes subsidies for the treatment of children and supports many charities. Natural and artificial aromas, sweetener: sucralose, acesulfame potassium, citric acid, coloring: brilliant blue FCF, stabilizer: silicon dioxide, amorphous.